WordTEAM is your very own online workflow system, designed especially for translators and other language service providers. 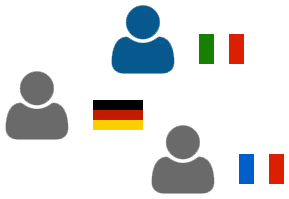 It allows you to work in a group of linguists so you can share resources, expertise and experience. Group members as well as clients have dedicated access to your WordTEAM system. The expertise offered by each group member is automatically available to clients. With WordTEAM only the workflow is automated; translation remains a human activity. It is a quick and simple process that allows you to make the big decisions, such as assigning translations and notifying clients when their assignment are completed. WordTEAM's advanced e-mail and SMS notification system ensures that you, your fellow team members and your clients are informed when something important happens. For example, you will get notified when a client sends in a new assignment, or when a team member finishes an assignment that needs your review.